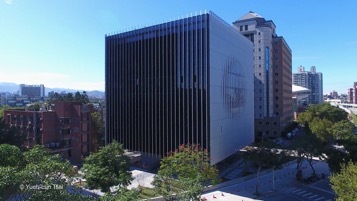 The Chee-Chun Leung Cosmology Hall seen from Sec. 2 of Xinhai road. 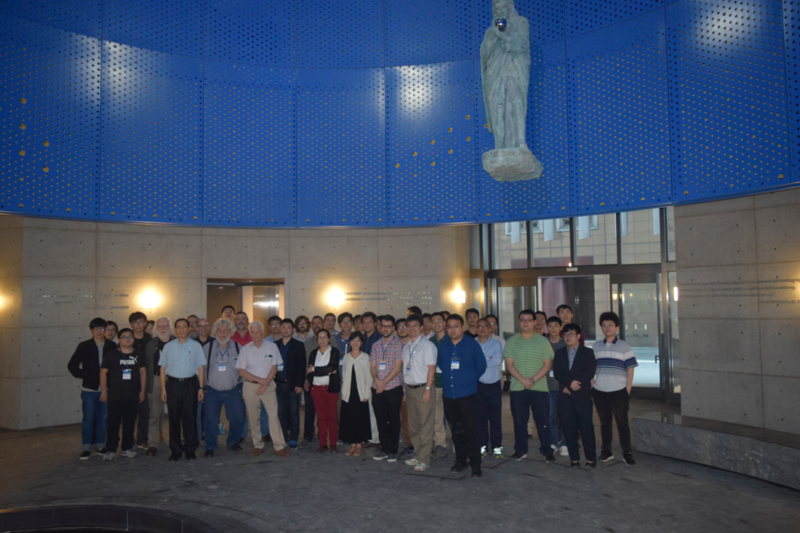 Last November 27, 2017 was an important day in the history of LeCosPA and the National Taiwan University as it saw the birth of a new building on our campus. 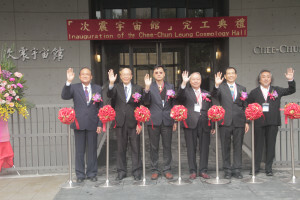 The construction of the “Chee-Chun Leung Cosmology Hall”, officially started in June 2015, was made possible by the generous donation from Dr. Chee-Chun Leung, co-founder and President of Quanta Computer Inc., to whom our center is extremely grateful! As for the shape of this new hall of cosmology, it is the fruit of famous architect Kris Yao’s imagination (KRIS YAO | ARTECH) and other actors of this ambitious project among whom Prof. Pisin Chen took a very active part in the internal and external design. Hard work from dozens of construction workers sourced the constant rise of the building over these last two years, emerging vigorously from the ground like a mushroom of metal, concrete and glass. This project is an achievement on several levels. Like science, it is supported by solid roots attaching it as deep as 40 meters down below the surface of the ground, offering the necessary stability for its 8-floors elevation towards the sky. While the height is 40 meters, the main body of the building is exactly 34 x 34 x 34 meters, a perfect cube seemingly floating 5m above ground without obvious support. 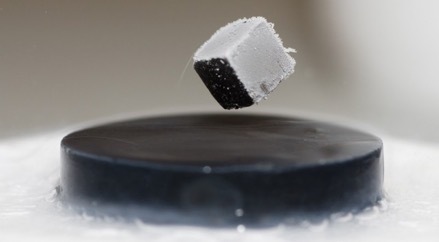 Our building thus appears as a cube in a superconducting experiments, levitating delicately over its base and looking almost as if it was defying gravity, like a metaphor for its soon hosting of researchers who try to crack the mysteries of quantum gravity. Located at the intersection of Jianguo Expressway (建國高架道路) and Sec. 2 of Xinhai road (辛亥路二段), there is no doubt that people passing by will notice this futuristic shape building, wondering about its nature and purpose. A lot of curious physicists were thus present on November 27 (2017) in order to admire this new academic research building dedicated to cosmology and, at the same time, celebrate the 10th anniversary of LeCosPA (which more precisely was on Nov. 13). The ribbon was cut simultaneously by (left to right) Jin-Tsai Chen (Chairman, Li Jin Engineering Co.), Si-Chen Li (former President of NTU), Twi-Wei Kuo (Interim President, NTU), Chee-Chun Leung (Donor and President, Quanta Computers, Inc.), Pisin Chen (Director, NTU LeCosPA Center), Kris Yao (Founder, Artech). and the public made its first entrance into the building by gathering in the modernly furnished conference room of circular design. 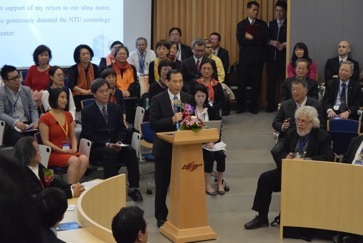 Numerous personalities brought their impressions and best wishes to the attention of the public, starting with NTU’s Interim President Prof. Kuo, Mr. Leung, Director Chun-Chieh Wu (MOST), surprise guest and former R.O.C President Ying-Jeou Ma, Prof. Ching-Liang Lin (Professor Emeritus, NTU), Prof. Frank Chang (President of National Chiao-Tung University), Mr Barry Lam (Chairman, Quanta Computers, Inc.), Mr Kris Yao, followed by several internationally renowned academic personalities: Prof. Gabriele Veneziano, Prof. John Ellis, Prof. Tom Abel, Prof. Misao Sasaki, Prof. Peter Gorham, Prof. Albrecht Karle, Prof. Chao-Lin Kuo, and LeCosPA Director Prof. Pisin Chen who closed the ceremony. Other prominent physicists who attended this event includes Prof. Bill Unruh and Prof. Alexei Starobinsky. The audience then had the chance to see for the first time the interior of the building and especially its central column reflecting the sun of this bright winter day onto its wall and inside its pond. 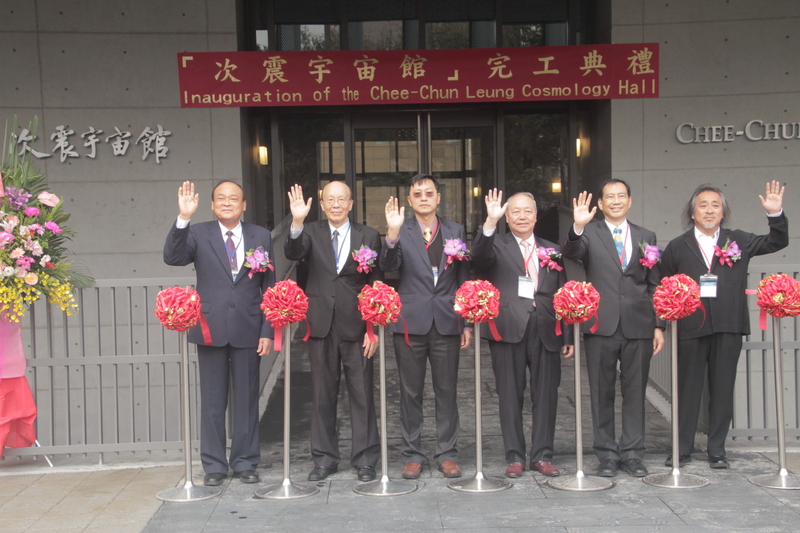 The Chee-Chun Leung Cosmology Hall will soon be ready to welcome researchers at the beginning of year 2018, including LeCosPA members from the theory and experimental groups. With its office area of 11,000 m^2 (3300 Ping), it will also host several other physics labs from NTU and will thus illustrate with radiance that cosmology is one particular branch of physics in which almost all of the other fields are represented.